The Chinese people have recognized to the benefit of acupuncture and herbs to treat all of their medical conditions for thousands of years. In addition, acupuncture is often effective therapy for other chronic and painful debilitating disorders which have no clear explanation or origin. Acupuncture is also useful in resolving physical problems related to tension, stress and emotional conditions. Acupuncture can be used as an additional and complimentary treatment for the side effects that cancer patients experience, such as overall pain and nausea (caused by other cancer treatments like chemotherapy). NCI reports that clinical studies of acupuncture as a treatment for cancer show that acupuncture can reduce vomiting and nausea caused by chemotherapy. They also found that a benefit of acupuncture may be improving the immune system, helping cancer patients to fight their condition and its side effects. The use of acupuncture for weight control is based on the premise that weight gain could be the result of imbalance in the body’s regulation center. In western medicine, this would be the hypothalamus. The hypothalamus is responsible for maintaining "homeostasis" or functional balance that allows the body to run well. It is the body's control center that regulates hormones and neurotransmitters, and helps to control body temperature, circadian rhythm, thirst, hunger, etc. Of particular interest is the ability of acupuncture to influence obesity hormones. Research measuring the benefit of acupuncture for weight loss found treatments increased ghrelin, a hormone that controls meal initiation and decreased leptin, the hormone that regulates fat storage and metabolism. In clinical practice, acupuncture works by curbing appetite, quelling cravings, boosting metabolism, improving digestion, regulating obesity-related hormones and enhancing the way nutrients are used. It also strengthens the function of the liver, the organ that produces many chemicals critical for digestion, processing nutrients and breaking down of fats. Acupuncture is an ideal form of treatment before, during and after pregnancy. It offers women a drug-free option for many problems that may arise from conception, pregnancy, childbirth, and postpartum. Regular acupuncture treatments throughout pregnancy can enhance the health and well-being of the mother. It can also help prevent complications during pregnancy and influence the development of the baby. Research shows that acupuncture can be helpful with many of the conditions that may develop during pregnancy. The benefits of acupuncture are evident in many infertility related conditions such as advanced maternal age, endometriosis, luteal phase defect, polycystic ovarian syndrome, premature ovarian failure, and unexplained infertility. Over the last two decades, there has been an increasing interest by Western doctors in acupuncture for the treatment of many disorders involving female reproductive system. Modern, western style (double-blind, placebo controlled) studies have shown that acupuncture can increase IVF success. Many IVF clinics are now referring their patients to acupuncture care, and some have even added acupuncturists to their staff. Many Gynecologists have begun referring their patients for the treatment of endometriosis, menstrual cramping, and menopausal symptoms. Acupuncuture can effectively treat addictions, including nicotine addiction. Using acupuncture to stop smoking can reduce the cravings and lessen the withdrawal symptoms associated with stopping smoking cigarettes. The acupuncture treatments focus on relieving jitters, cravings, irritability and restlessness; all symptoms that people commonly complain about when they quit. It also aids in relaxation and detoxification. Our success rate is about 70%, which is better than Zyban and patch combined. Fibromyalgia is a complex syndrome with chronic widespread pain, a heightened and painful response to pressure, insomnia, fatigue, and depression. The cause is unknown. While not all affected persons experience all associated symptoms, the following symptoms commonly occur with fibromyalgia: chronic pain, debilitating fatigue, difficulty sleeping, anxiety and depression, joint stiffness, chronic headaches and jaw pain, dryness in mouth, nose, and eyes, hypersensitivity to odors, bright lights, and loud noises, inability to concentrate (called "fibro fog"), incontinence, irritable bowel syndrome, numbness or tingling in the fingers and feet, painful menstrual cramps, poor circulation in hands and feet (called Raynaud's phenomenon), and restless legs syndrome. 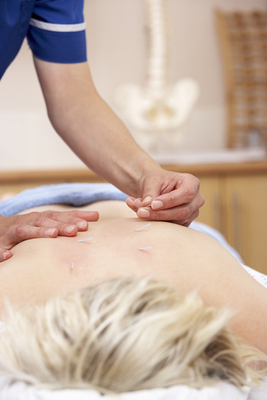 Acupuncture does not recognize fibromyalgia as one particular disease. Pain is seen as a disruption of the flow of Qi within the body. The disruption of Qi that results in fibromyalgia is usually associated with disharmonies of the Liver, Spleen, Kidney or Heart Meridians. We treat the specific symptom patterns that are unique to each individual patient, depending on his or her constitution, emotional state, intensity and location of their pain, digestive health, sleeping patterns and an array of other signs and symptoms. Body-ache and arthralgia can be due to trauma, Wind, Cold, Dampness, Damp Heat and Damp Cold. Overt and cumulative trauma represent the Yin and Yang extremes of the same clinical pattern. They both present with well defined pain areas and limitation of motion. Frank trauma has swelling, redness, aversion to touch, while cumulative trauma has nodules and cords in the tissue that like to be massaged. Frank trauma’s pulse is tight and wiry while cumulative trauma’s pulse is softer and more “choppy.” Wind pattern patients have migratory arthralgia, decreased ROM, aversion to wind and maybe even a mild fever. They have pale red tongue with thin white coat and floating pulse. Cold patterns, on another hand, have well defined pain regions without accompanying redness or heat. The pain is dull and achy rather than burning in character and it is lessened by heat but worsened by cold. Patients present with pale red tongue and thin white coat as well as tight & wiry pulse. Damp pattern patients complain of heaviness in the body in general as well as in the area of pain. There maybe swelling and bloating as well. The pain is sore and achy rather than stabbing in character. Patients have red tongue and thick white coat while their pulse is slow and soggy. In contrast, Damp Heat Patterns have redness and swelling. Patients again complain of fatigue and heaviness in the body. One unique feature is that they suffer from thirst but can’t drink much. The pain is alleviated by cold but not by massage. They have red tongue with yellow greasy coat in addition to a slippery and fast pulse. Cold Damp patterns usually have a long and recurrent course. In addition to significant limitation of motion there could be swelling or even atrophic changes in the skin and muscle atrophy. Patients may complain of decreased sensation in the affected area as well. Their tongues are pale red and in severe cases they can be dark or even purple. The pulses are usually deep and tight. These patterns of disharmony are not only applicable to common orthopedic conditions but rheumatologic conditions like Behcet’s syndrome, rheumatoid arthritis and seronegative spondylo-arthropathies like AS or even neurologic conditions like Charcot’s joint. Acupuncture in conjunction with herbs is especially effective in treating collagen vascular diseases and autoimmune diseases that have body ache as one of the presentations, such as polymyositis and polyarteritis nodosa. Congestion of Middle Burner (fogginess and muddled thought, heaviness in the head and body, distension and discomfort in chest and abdomen, dark tongue with thick greasy coat and deep and slippery pulse). These are just some of the benefit of acupuncture and the most typical textbook patterns of disharmony and in clinical practice one often finds a combination of these patterns. All these can be effectively treated with acupuncture in conjunction with herbs.